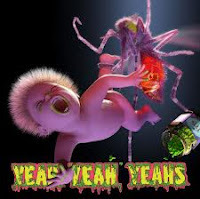 Unlike the recent album from The Strokes, the announcement of which fills you with immediate dread, a new record from the Yeah Yeah Yeahs supercharges you with expectations. The band don't disappoint with their fourth full length album Mosquito. You can always count on the Yeah Yeah Yeahs to come up with some new twists in their music. The first is the presence of a choir on the opener "Sacrilege". The song begins with a catchy drum beat, and sees Karen O alternate between shouted and muted vocals. The choral ending takes the song to a conclusion that could not be predicted at its outset. The choir reappears on delightfully discombobulated sensory overload "Under the Earth". Esteemed hip hop artist Dr. Octagon is tapped for an appearance on "Buried Alive", which also boasts Nick Zinner's most impressive riff in years. On this record, more than any other, the band are compelled to try to recreate the sounds of a the places they sing about. On "Subway" that means a percussion that emulates the clacking of trains on tracks and a subterranean vocal. With "Area 52" and its alien theme, it's arrangements that sound like slashing laser beams and whirring flying saucers. There are more typical Yeah Yeah Yeahs moments as well. The band is boisterous and Karen O is downright nasty on the title track, while "Slave" is a slick and flashy aural assault that continues in the mold of It's Blitz. "Despair" builds into a tour de force in the vein, if not quite the quality, of "Maps". The low-point is "Always", a dreamy track that verges on snoozy. "These Paths" is also an immediately forgettable number. In all, Mosquito is another solid addition to a strong catalogue. The most exciting part is that there is absolutely no telling what direction the Yeah Yeahs Yeahs will choose to go from here.